Leaf design pearl and cz pendant mounted on an extendable sterling silver necklace chain. This unusual leaf design pearl and cz pendant is mounted on an extendable sterling silver necklace chain. A stylish and unique pearl pendant necklace. Your pendant will be delivered in a quality pendant box, suitable for gifting. 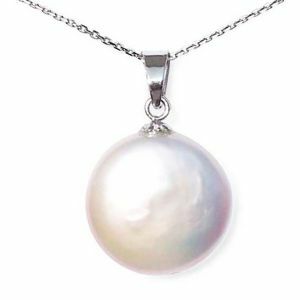 These fashionable coin pearl pendant necklaces feature high quality cultured freshwater coin pearls and are mounted on a slim sterling silver chain. Choose from 3 natural pearl colours. These stylish 7mm teardrop pearls are mounted on a sterling silver pendant, with an 18" slim sterling silver necklace chain. Choose your pearl colour from white, peach, lavender or black.